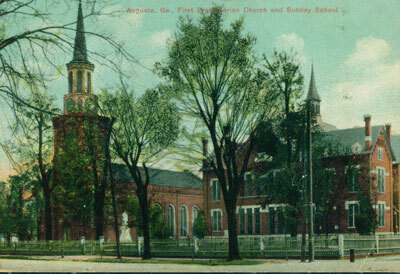 Thomas Jefferson was President of the United States and Lewis and Clark were exploring the newly purchased Louisiana Territory in 1804 when First Presbyterian Church was first organized in Augusta, Georgia. For more than two centuries, the church has been meeting the spiritual needs of people in the Augusta area and around the world. The story of First Presbyterian has been inexorably linked with historical events in the city, the state, and beyond. Reverend Joseph R. Wilson (father of Woodrow Wilson) was pastor of the church from 1858 – 1870. After the Battle of Chickamauga, the pews were removed and the church building was used as a hospital for wounded Union and Confederate soldiers, thus embodying Christian charity. Because Union prisoners were held in the church grounds awaiting transport, young Woodrow had a clear view of the horrors of war from the manse across the street. As U.S. President, he was instrumental in forming the League of Nations in an effort to settle disputes without war. But nations do war, and the church has offered aid and comfort to strangers as well as members during wartime. During World War I and World War II, the church facilities became a religious and social center for troops in training near Augusta. The congregation still worships in the original wooden frame structure designed by famed architect Robert Mills, who also designed the Washington Monument. As rich as the church’s history may be, we look forward to the rich future the Lord has yet to reveal.